Nice work! Can't wait to try it. I have been using IFC files to clash against architectural elements, working to coordinate mechanical shafts. I haven't had much use for IFC files, but it seems to work best when inserting information back into a Revit "container" file. However, when I import the IFC file all the model information is dumped into Generic Model. It would be great if you could keep a database info in the IFC when you import it into Revit. Thanks for the comment. Your experience of using IFC for coordination and model overlay is typical of it's use for date (IFC certification for software companies has been for coordination model). But my personal project experience has always been trying to minimize the number of times an aspect of a project is modeled, and that is the premise of model exchange using IFC. Lots of early project work is being down in software such as Rhino/Grasshopper, or sketchup or .... and it's not effecient use of man power to trace or start modeling from scratch if the project has reached a stage where it needs BIM software such as Revit. Building Smart Certification is also changing to a model exchange which is great to see. I will be considering means of IFC data retention in Revit, but the real focus is to as many native Revit objects created with attributes to use the software as intended. Looking forward to the day this becomes a two way process with Revit, I have one question though, did the member sizes in the Revit model come from Rhino/Grasshopper or are they applied to the exported geometry once inside Revit. I also see Revit has played its usual trick of pulling apart the beam end joins randomly, in my experience it also does this when 3D snapping beams to mesh stick geometry imported from .dwg and can be a real pain to get the result you're looking for. Hi David, I look forward to that day too, hopefully sooner rather than later. The plugin at present creates (most) profile shapes as a family from the IFC data, or uses existing family if the same name already exists. It doesn't validate "consistent" profile shape yet, but I hope to develop that. The beam end joins are a problem, they slow down the process and don't produce great results in this example. I have requested to Autodesk a mean to disable this (for early scheme design overlap would be acceptable) and hope to be able to override this junction data if it exists in the IFC data. Not sure how quickly this will be enabled but customer support will help. Great work! Definitely has lot of potential. Can't wait to try it! Great work, I was wondering if you have tested IFC in Bentley Architecture (or AECO Building Design)? This might be not needed as for Revit, GC has implemented BIM features allready, but I would love to play around, mixing GH and Bentley BIM software package. I welcome and encourage you to test interaction of GH generated IFC models with Bentley. I don't have access to this software so I have no idea of the level of comprehension they have developed their IFC engine. Other users are doing similar with Archicad and Digital Project. I will consider in time developing plugins for other software to import IFC as required. I chose to do Revit first and foremost due to it's popularity and the ability to adopt my C# engine. I'm happy to assist and advise with users of any BIM software out their in the process of model interaction. 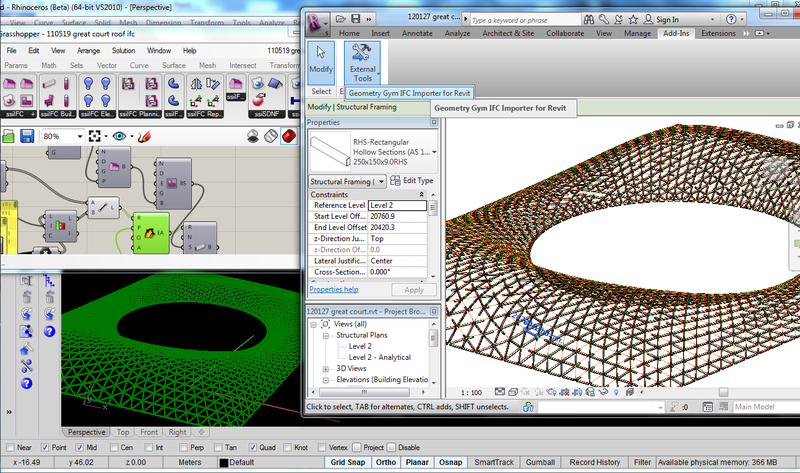 I am finding it impossible to load grasshopper for Rhino. Its a great option! Feel free to email me with any error messages if this doesn't help. By any chance you are releasing your C# IFC engine as an open source project? It's not impossible that the project could be released as openSource, but at this stage it's highly unlikely. I rely on revenues from licensing to commercial users to sustain full time development of it, and I'm not confident there is means to continue if it became openSource. You should take a look at the IfcOpenShell as an option for open c# code.